Get That Guestroom Spruced up For the Holidays | 41 Lumber - Serving Iron Mountain and the U.P. If you’re ever going to need a guest room, the Holidays would most likely be the time. As family and friends travel to be with each other during this time of year, what could be more welcoming than a thoughtfully prepared guest room? While many family members from afar would simply appreciate a couch or a cot to sleep on, having their own space would make their time in your home even more enjoyable. Below we’ll discuss some of the things you can do to make your guests feel more at home. A clean, fresh coat of paint can do wonders --and it can be accomplished in just one weekend. Also, since it’s a spare room and isn’t lived in all of the time, then why not have a little fun with your colors? With more flexibility in your décor choices, you can set your guest room apart from the rest of the house. Most spare rooms are notoriously known as the place where the extra stuff goes. Old chairs, desks, dressers, etc. always seem to find their way in. Now could be the right time to select and install new lighting fixtures and say good bye to those old extra lamps. This is a fairly inexpensive and easy project that can add a lot of pizazz to an otherwise plain room. 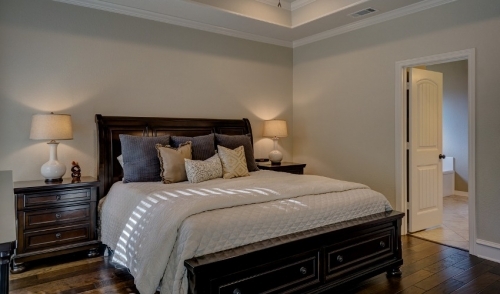 Install a dimmer switch to provide your guests with more lighting options. A ceiling fan can do double-duty and help keep your guests comfortable. Many times, the spare room is the smallest. As mentioned above, it’s also the place where all of the extra stuff ends up. To ensure your guests won’t feel like they’re being relegated to a storage room, this would be the perfect time to clean it out and de-clutter. The extra elbow room will make them feel more comfortable and welcome. A closet organizing system may be all you need to put things in order. If that isn’t enough, then try purchasing storage bins and send the things that you can’t part with into the attic or the garage. The things you no longer want can be donated or discarded. Under-bed storage bins are another good way to free up space. Make sure there is room for them to hang clothes. Either a wardrobe or at least a dedicated section of the closet should suffice. Have empty hangers at the ready. A dresser with at least the top drawer empty would be helpful. Fresh flowers, magazines, bottled water, or chocolates are always a nice touch. An alarm clock on a bed stand is a good idea. Keep an extra supply of toothbrushes, toothpaste, shampoo, etc. for guests who may have forgotten to pack thoroughly. If the room has been closed off for some time, freshen it up before the guests arrive. Open windows for a little while or put in a new air freshener. There’s an old adage that says if you have a guest room in your home, you should sleep in it at least once. Give it a test drive and treat it like a little getaway in your own house. If you were comfortable, than chances are your guests will be too. For any questions about paint, lighting, storage and organizing, or anything else you need to make your guest room ready for primetime, stop in and our knowledgeable staff will be happy to assist you.